I also want to make one thing very clear. When I use the word “outsourcing” I am not referring to sending work to other countries or using “cheap labor”. I am simply comparing an alternative to hiring someone in-house versus an outside firm to handle the function. Let’s start with the big one: saving money. Every business wants to save money. Hiring an accountant in-house can be a very expensive undertaking. You will most likely need to pay for their benefits, payroll costs and training. If you hire them full time you will also be paying for that person in their down time when they might not have much to do. These costs can add up very quickly. Outsourcing this function can virtually eliminate all of these costs. You pay for the time you need and nothing more. Hiring someone in your business to later have them leave can cost you a lot of time and money. It is no different when hiring an accountant for your business. If that person decides to leave, you are starting from square one. Outsourcing this function and hiring a firm helps to eliminate some of this risk. Unless the company going out of business, there will always be someone there to handle your work. There is a much better chance of someone quitting then a company going out of business. I have also seen multiple situations where one person was handling everything for years, decided to leave and things were a disaster. That person knew all the ins and outs of the accounting for that business. Many times that person kept everything to themselves and had their own “way” of doing things. When they leave, chaos ensues. A full-time employee typically has no “equity” in your business. Whether you are growing like crazy or fighting to stay alive, as long as they get their paycheck, they are probably pretty happy. Obviously there are some outliers to this statement but generally this is the case. When you outsource, the company has a much bigger stake in your success. When you succeed, they succeed. It is much easier to fire a company then an employee. They know they need to do a great job and help you grow or you will most likely be moving on. Plus, as your company grows and gets more complex, the fees tend to go up. This is a win-win for all parties involved. What happens if your employee gets sick? Goes on vacation? Simply doesn’t want to show up to work one day? There is no back up plan. The accounting department goes as they do. When working with an outside company, you should have multiple people who know your account and can pick things up at any time. Having someone always available to answer questions or handle a task is a big deal. A single person only has so many experiences they can draw from. A company on the other hand will have many clients they are currently working with to learn from. Think about this scenario. A company works with 30 different clients. They implement something for one of their clients that makes their business way more profitable. They are then able to bring up that solution to all of their clients and try to replicate a similar result. To me this is invaluable. If you have an in-house employee they are only going to know your business and maybe draw from a few past experiences. 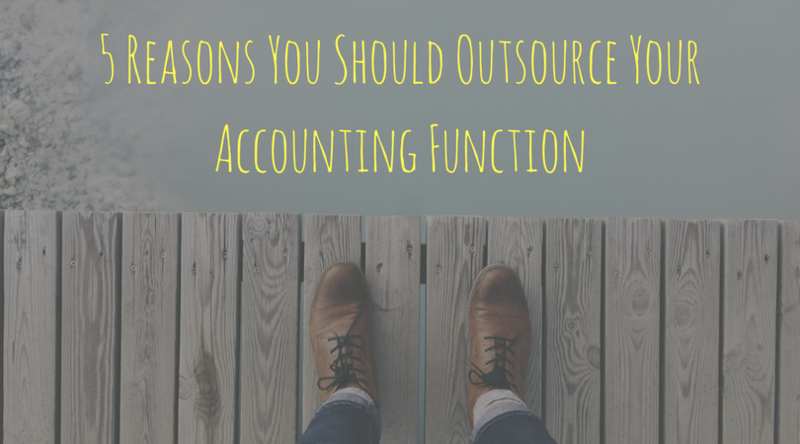 Obviously I am writing this article because we provide outsourced bookkeeping, controller and CFO services. However, I truly feel that outsourcing is the wave of the future. Why hire a full-time controller at $100,000/year if a firm like ours can provide all the services you need for a fraction of the cost. I understand this is a newer concept and a progressive way of thinking, but I hope this at least gets you thinking differently. There are absolutely times when an in-house person is the right solution. However, I have seen time and time again a situation where the company hires an in-house accountant and their main reasoning is “that’s how it has always been done”. To me, there isn’t a worse reason to do something. I would love to hear your thoughts on outsourcing in general. Drop me a line and let’s have a discussion. Have a great weekend!